“Yonder are the Hessians. They were bought for seven pounds and tenpence a man. Are you worth more? Prove it." Last edited by MilsurpMonkey; May 05, 2018 at 22:16. I gotta pack the truck. Or at least start painting steel. Bets you have to unpack the truck to pack the truck? Last edited by Tat2; May 07, 2018 at 00:47. Easy dude, I’m not trying to take over anything. I just read back though stuff I have not paid attention to and you said you changed your mind about your plan. So we changed it and you could shoot whatever. We have precedence of guns and ammo provided. AK shoot. Didn't own one. Shot it. Mil surp bolt action. Didn't own one. Shot it. Bought one for a bit. You did your Fal shoot, I didn't. No biggie. I have done for many shoots now. to have fun with us. Also, I was at the entrance of Sea-Tac at the start of the lockdown. Back an hour later. Bad day. No worries dude. Just stating my thoughts. You know I always enjoy your company. I have missed some good times and I hope I can make it this year. Pistol event should be fun, the pistol being provided as a loaner has been shot by quite a few first time shooters, and has proven accurate to all of them. Don't be afraid to give it a try, the sights were set by a little old grumpy German guy in 1996 at the factory and have done well for everyone since. Where exactly is the pistol event written? And what is the “loaner” Gun and caliber? Do we need to bring Ammo for it? Why do I feel like this is a trap? A Sig 226 in 9mm and a Webley .455 will be there. Personally, doing the Webley myself. I can see the logic of this. I’m n the event you ever have to pick up something unfamiliar, can you hit with it? Bravo, Jason. Not a DA. The first shot must be from hammer down. Dude, that's awesome of you! Do we have to use one of the loaner guns, or can we shoot our own DA/SA gun? You can use your own. These are for people that don’t have one. Any recommendations for fishing near Hood River? I bet 4x401 is the source for that. If you aren't fishing for salmon and/or salmonids, and want to catch lake trout, you could go up on the mountain (Mt. Hood). There are drivable lakes of varying sizes that must get stocked - though this isn't my AO, so I don't know. I could probably arrange a guided trip BUT it would be in the Portland area. About 6 months ago my Dad bought me a new 23' NorthRiver jet sled. In other words, My Dad is retired and likes to fish, When he kicks the bucket the boat is mine. Hopefully we have the opportunity to wear the boat out before he kicks the bucket. Rich - that is super boss. Thanks for doing that! Crap, need to load the 100 prepped cases like ASAP. Apparently my purchasing of a new 5" Barrel Pistol will be for naught. I did have a SIG 228 which is the shorter version of the 226 however. It was an OK pistol. Not intimidating at all. I didn't get the job, but I did force them into a second interview which has only happened one other time in my 19 years. There's a chance that I could slide into the same job later due to other moving and shaking going on. If it happens before October they can go off the same interview panel and I slide in. We'll see. Getting a better scope for the 3 gun. Will be interesting and fun to see how it works out. 'Scenario + Rules + Not-Stage-Description'... just like you always wanted. Due to time constraints and a general lack of enthusiasm for my bitchin' serial last year, we're just going to give it to you straight. 1. Stage will start with a handgun of your choice - loaded with one round only - in the low-ready position. Engage 6" target @ 25 yards in less than 5 seconds. If you miss, or if you go beyond the allotted 5 second time limit, it will be considered a miss. This stage-beginning Ironsman Challenge is part of the ongoing Ironsman Challenge for the weekend AND is part of the 3-gun scoring as well: this means that when the buzzer starts, the 3-Gun event clock is running. 2. Proceed to next firing station with empty handgun. Upon assuming the proper position, load and engage targets. Do NOT engage no-shoot targets as they are my children - and it will cost you dearly. After completing firing position, unload and lock open the action. 3. Proceed to the next firing position and reload the handgun. Engage targets to include zombies and infected U.N. troops. Again, Do NOT engage no-shoot targets. After completing firing position, unload and lock open the action (yep, do it again...), and place on table. 4. Retrieve supplied shotgun and ammo, load shotgun, and engage targets. Solve your problems without asking any questions. Think that over. 5. Place shotgun in receptacle and proceed to the next shooting station. Take the supplied weapon from the receptacle and breach the doorway. Engage targets of opportunity with available weapon. Solve your problems without asking any questions. 7. Proceed to barricade and engage steel targets: One (1) target per portal (total of six (6), but you can use as many rounds as it takes to get your hits. 9. Upon completing shooting position, ground rifle on the mat, stand and turn to the final target, retrieve rifle and shoot the silhouette @ 100 yards from standing (strong side). 10. 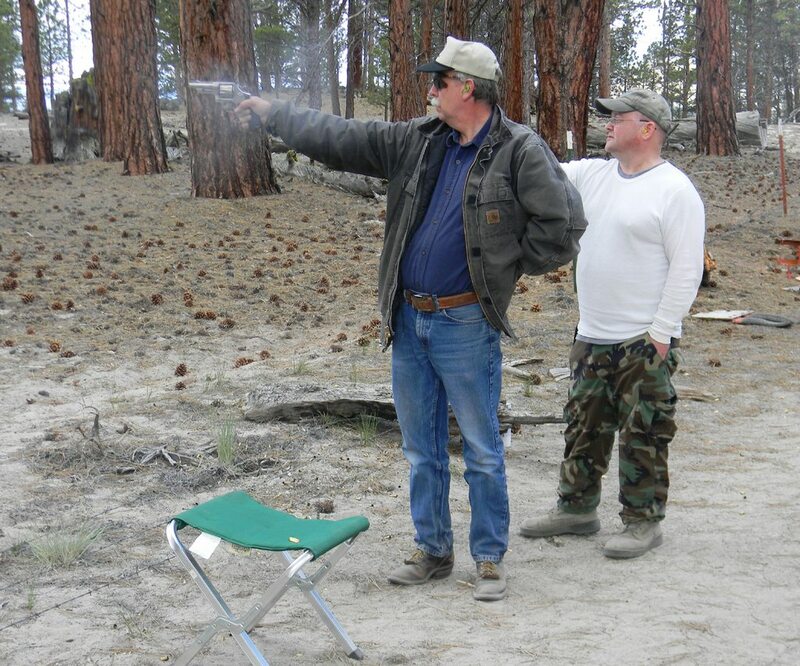 Weep for joy at being able to participate in such a beautiful and well-conceived 3-gun event in the gorgeous high desert of Central Oregon. Wipe eyes. Give hugs. Vow to return with your progeny next year. Last edited by brunop; May 17, 2018 at 11:03. 1. If you hate anything about this event, it's Jonathan's fault. 2. Jonathan doesn't care what you think. a. all steel will be painted black for ease of identification and sight picture. b. all no-shoots are going to be white cardboard. You know the rules. c. paper targets will be of three types: green-colored zombies, random bad guys, and "infected" U.N. troops wearing ad-hoc uniforms and blue helmets. These magical blue helmets render headshots useless. Steel targets require one hit. 1. one head-shot where feasible. "Head shot" = any place in the upper 'A' + 'B' zones. Think about what it takes to kill zombies. Shotgun targets are steel poppers and clay pigeons. Solve your problems without asking any questions. Last edited by brunop; May 16, 2018 at 15:10. So if I bring my 1919 and just mow down the course with a chain fed weapon, will my low time score offset any no-shoot infractions? I'd love see a chain-fed 1919 on a sling. I think this course is doable in that manner. The 'slow-downs' are going to be when you 'walk' your shots out to 350 yards, when you move from position to position, when you breach the door, and when you shoot left-handed. I don't think your speed is going to overcome your no-shoot penalties, since every single no-shoot target adds 60 seconds to your time. Meaning you could theoretically smoke all the targets in ten seconds, and end up with a time in the 8 or 10 minute time-frame. If you have any 'misses' - to include missing required headshots (zombies) and chest 'A' zones (soldiers with helmets...), that will add more time yet. But you do what you want. Note to self: pack HK USP. Shooting a no-shoot target OR shooting a legitimate target in such as way that the bullet passes through a no-shoot target is THE SAME THING, and will cost you 60 seconds. Failing to neutralize a target, not engaging a target, and/or missing the zones on the target that you engage is THE SAME THING, and will cost you 15 seconds. So scores this year will not be "Time" + "Score". It will only be "Time" + "Time Penalty" - with penalties being given for "non-neutralized targets/misses" and "no-shoots". As in the case of last year, we're looking for accuracy more than speed. Can't kill the Merten Children while you're running around trying to save the Merten Children.